Dangerous and potentially deadly drug interactions are preventable medical errors that affect millions of Americans every year. Reactions between medications, or even drugs and certain foods, can make medicine less effective, increase its potency or lead to unexpected side effects. Drug interactions can occur with any type of medication, including prescription drugs, over-the-counter medicines, vitamins, dietary supplements and herbal products. 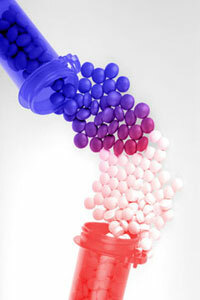 , acetaminophen is the leading cause of drug-induced liver failure in the U.S. Many patients run into problems when they unknowingly take two or more acetaminophen-containing products at the same time, and experience a potentially fatal acetaminophen overdose. Cordarone (amiodarone): This medication, which is used to correct abnormal heart rhythms, has been linked to a dangerous muscle condition called rhabdomyolysis when it is taken with high doses of Zocor, a cholesterol-lowering statin. This medication is also known to reduce the effectiveness of warfarin, a blood thinner. Lanoxin (digoxin): Norvir, a drug used to treat people with HIV, can increase the potency of Lanoxin. This can lead to dangerous irregular heart rhythms. Over-the-counter (OTC) Antihistamines: Some antihistamines can increase the depressant effects of a sedative or tranquilizer, leading to drowsiness and an impaired ability to focus. Antihistamines taken in conjunction with certain blood pressure medications may cause a person’s blood pressure to increase and may also speed up the heart rate. Alcohol: Alcoholic beverages should be avoided while you are using any medication, as they can greatly increase or decrease the effects of many common prescription and over-the-counter drugs. Grapefruit Juice: People taking certain blood pressure medicines or cyclosporine should not take these medications with grapefruit juice. Buspar (buspirone), certain anti-malaria drugs, and Halcion (triazolam) can also interact dangerously with grapefruit juice. Licorice: Some types of licorice can place Lanoxin patients at risk for toxicity. Licorice may also reduce the effects of blood pressure drugs or certain diuretics. St. Johns Wort: Due to its effects on liver enzymes, St. Johns Wort can increase the blood level of medications such as Lanoxin, the cholesterol-lowering drugs Mevacor and Altocor (lovastatin), and Viagra (sildenafil). Vitamin E: The blood-thinning effects of warfarin can be decreased in people taking vitamin E.
Ginsing: This herb can also interfere with warfarin. In addition, patients who combine ginseng with MAO inhibitors may experience headaches, trouble sleeping, nervousness, and hyperactivity. The FDA advises patients to take steps to avoid dangerous drug interactions. These include asking your doctor about foods, supplements and medications to avoid whenever you are prescribed a new drug. You should also check with your pharmacist or doctor before you begin using an OTC medication to insure that it will not interact with any of your prescriptions. Keep your healthcare providers informed about the drugs your are using, and take a complete list of your medications to all of your medical appointments.